Lobster mac and cheese. Crabcakes. BBQ shrimp. 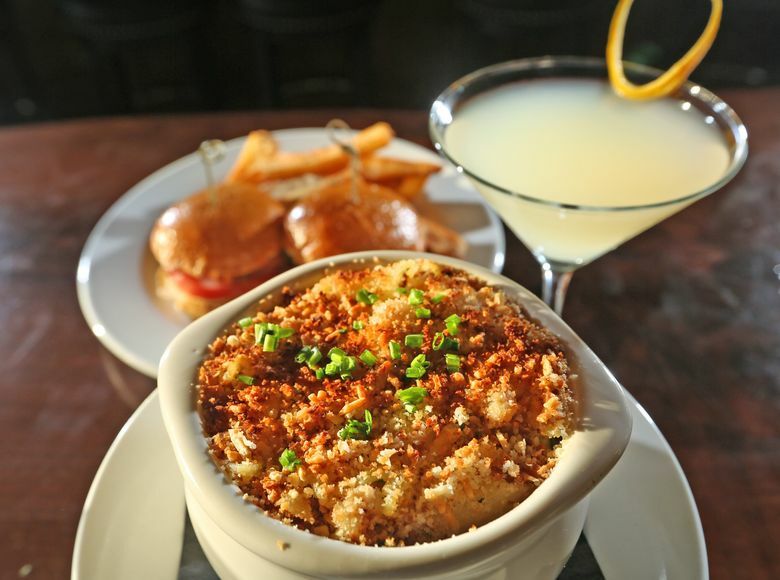 The snacks at this new Edmonds spot make its happy hour one of the best in the area. Last Thursday, after a storm, late-afternoon light slanted in from the southwest and, on cue, the crowd trickled in, ready to feast. They looked famished. They looked thirsty. They grabbed lobster mac and cheese, and wolfed down crabcakes and fish tacos. Cocktails are on the sweet side, but that’s beside the point. They’re cheap (most $6-$8) and serve as aperitifs for the gluttony to come. 190 Sunset is one of the best happy hours in Snohomish County, and it would also be among the best in Seattle if the bar were 15 miles south. But, alas, you have to head to Edmonds. 190 Sunset, its namesake address, sits a couple of blocks from the ferry terminal and waterfront. And so the theme is seafood. A bowl of gooey Gruyere and penne pasta comes with lobster tail, with meat in every bite. Crabcakes in the sliders also come in chunks instead of stringy strands. And better for it. BBQ shrimp were snappy and spicy, though the accompanied grits were as sweet as dessert. And the marbled filet carpaccio was marred only by too much extra-virgin olive oil. The chef is from Toulouse Petit in Queen Anne and Metropolitan Grill downtown, places that know a thing or two about happy hour. Well-lit, the bar restaurant sits in a giant space under a curved roof that calls to mind those supermarkets from the 1960s, which at one point the space was. Now it’s a complex that houses the Cascadia Art Museum on one side, and on the other 190 Sunset is sandwiched between the craft-beer joint Brigid’s Bottleshop and Scratch Distillery. You can also get 190 Sunset’s happy-hour food delivered to Brigid’s Bottleshop. Grab a seat on the couch. Pair the food with a Duvel or a Chimay beer. A happy hour for kings. 190 Sunset is located at, well, 190 Sunset, Edmonds. Happy hour weekdays 4-6 p.m. and seven days a week from 9 p.m. until closing, with $9-$11 seafood snacks, well drinks $5.50, selected cocktails $6-$10, $3-$4.50 beers and $6 wine (425-329-3669; 190sunset.com).